How Safe Is Your Copy from the Curse of Knowledge? At 4:00 a.m. Wednesday, March 28, 1979, plant operators at the Three Mile Island facility set into motion the worst nuclear accident in U.S. history. And it all started with a minor malfunction exacerbated by human error. Did you catch that? The operator misinterpreted the label of a warning light. Why? The curse of knowledge. The curse of knowledge is a self-indulgent belief that everybody knows — and should know — what you know. In other words, it’s a failure to imagine people know less about your subject than they actually do. And often they know a lot less. For example, the engineer who designed the nuclear reactor control console probably thought it would be obvious what the indicator light meant. Knowing what he knew, he assumed the engineer would know it, too. What the designer failed to do was estimate the operators knowledge and skill. A simple user test would’ve settled that debate. The designer failed to put himself in the operators shoes and, ultimately, failed to communicate. Norman goes on to explain how objects have affordance: a visual clue to the function of an object. Good design helps people understand how to use an object. That’s how they communicate. Norman’s favorite example is a door handle. A flat plate suggests you push the door open. A curved bar suggests you pull the door open. 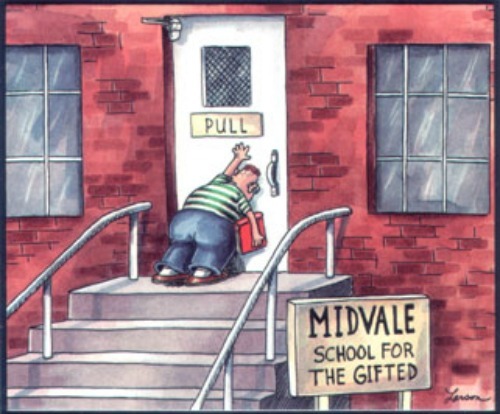 Which leads me to my favorite Gary Larson cartoon. As you can imagine the curse of knowledge is alive and kicking in the writing world as well. Exhibit one: the Wiki entry above. It’s a work of abstraction with a few concrete clues thrown (coolant, operator, water, and reactor). But it’s hazy how these terms work together. The writer didn’t take into account the sophistication of the reader — or rather her lack of sophistication — so failed to communicate. What we see here is a writer reveling in her professional language and abstractions. Clearly she’s learned something — and learned it well. What she’s forgot is that other people may not know it. And she forgot to check to see if her readers knew it as well. So, she’s failed to communicate. He was consistently using words like bid, sets, and tricks. I knew what those words meant, but they clearly had a different meaning in this context. He was assuming I was smarter than I was. I was flattered, but confused. It would’ve been better if he had treated me like I was stupid (that is what you should do with your readers, by the way). That young man’s behavior highlights another feature of the curse of knowledge. “The better you know something,” said Steven Pinker, “the less you remember about how hard it was to learn.” Naturally, euchre was easy to play for that young man because he’d already mastered it. Of course, the amount of abstraction you can get away with depends on the sophistication of your audience. But discovering that is no easy task. Best to assume too little than too much. New bloggers, under the assumption that most people already know as much as they know about their subject, are victims of this curse when they skip the basic stuff and crank out advanced content. They then wonder why their audience is so small, so narrow. Only experts who share their parochial mindset can follow their communication. Ultimately, the antidote to the curse of knowledge is to remember and obey the golden rule of clear writing: treat readers like they are in a conversation with the writer. And then direct her gaze to something in the world. Do this and you will be communicating clearly. And this starts with understanding your reader. 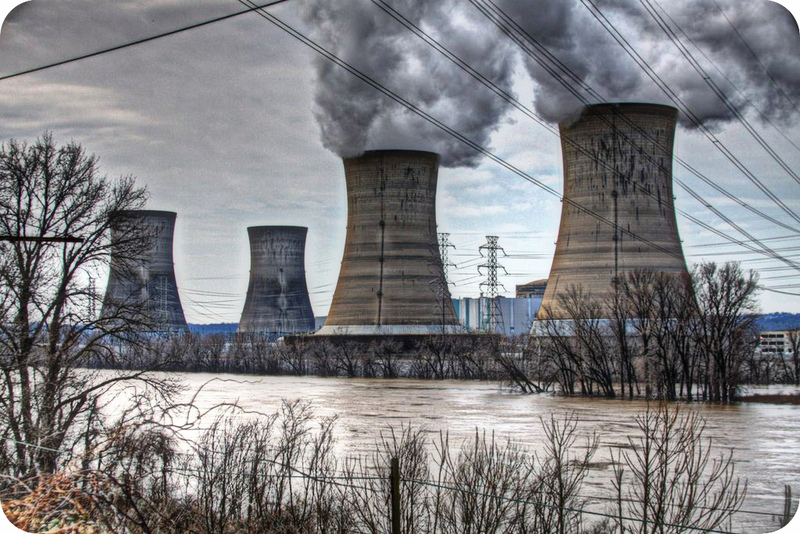 Sources on the accident at Three Mile Island include PBS, Smithsonian, United States Nuclear Regulatory Commission, and Nuclear World Association. This blog post is my second reminder today to beware the Curse of Knowledge. I was rereading a section of Made to Stick earlier as I was doing research for my book. I see this problem a lot working with clients in the tech sector where jargon, abbreviations, and technical terms galore. People may know their stuff but they forget that they’re supposed to be educating the Reader/Prospect who may NOT know as much. Sometimes, I think people write to impress their peers and neglect their reader. I love the Donald A. Norman quote. It reminds us to communicate–which is a two-way exchange–instead of broadcast. Oops! I meant “with” not “where”…. That is a sad state we can all fall into: trying to impress our peers. And an easy temptation to indulge. It’s easy praise. Much harder, but more satisfying is praise from a satisfied audience. Great Topic. Donald A. Norman quote reminds me that communication is meant as a medium of exchange. Loving the post too – echoes your point about ‘anti-intellectualism’. He believes that the most powerful copy is ‘anti-intellectual’. They don’t want to decipher a sarcastic headline or climb over a morally challenging rhetorical question. They want their hands held – right from your hook, all the way through to your call to action. And they want to be nodding their head in blissful agreement along the entire journey. Thanks Demian, I’m still learning from you after two years. You humble me, Rob. Thank you. Last night I was working on an initial draft of a similar article for churches. Christians have a tendency to speak in tongues when communicating ideas (i.e., Christianese). Your article will serve as a great source for my work. Great point, Jesse. I was working on another project and found myself very aware how easy it is to do that … fall into Christianese. Best I assume a wider audience, ignorant of terms like “elder” and “redemptive history.” 😀 And, in my mind, that’s a better audience to have. Great cartoon. It illustrate the theme nicely. I had to read those passages a few times to understand what the writers were saying. Science and technology writers are fond of using abstractions. They seem to think readers know as much as they know. People who are familiar with your theme don’t need the abstraction. Those who are less knowledgeable need all the help they can get. This help comes in simple nouns and verbs. The thing is we must remember that most of the time we write for people who less about the topic than we, the writers, know. I think some writers are afraid of making things explicit out of fear of seeming to write down to people. And what’s funny, at least this happens to me, when I have to read something like that two or three times, I think, man, I’m dumb, it’s my fault. It’s taken me awhile to realize I’m not dumb, the writer is just not helping me out, and it’s his fault. Excellent post, Demian. When I was trained as a police composite artist, I was told to lose my artistic ego and simply draw what the person remembered. Don’t make the sketch pretty, make it look like what you’re told. I think there’s an analogy there to blog writing. Don’t write to impress or make it pretty, write so others understand the message! There are a lot of similarities between those two. We are after realism, right? Great stuff as always Demian! The real problem is perspective: can we accurately put ourselves in someone else’s shoes? Are we accounting for the fact that the people reading have had different experiences than we had? It’s why the testing phase is so vital!